Highlighting and discussing events in cycling and using myWindsock to improve performance. Massive upgrades to report! The new Strava Segment Filter which help you locate key Strava Segments; customise Watts for Segment efforts on Routes; layout improvements for larger screens; and we now auto offset your Wind Lines for improved clarity. Here are the latest updates in more detail. This is a huge upgrade that we are really excited about using. Find the Strava Segments you are most interested in with the new Segment Filter. 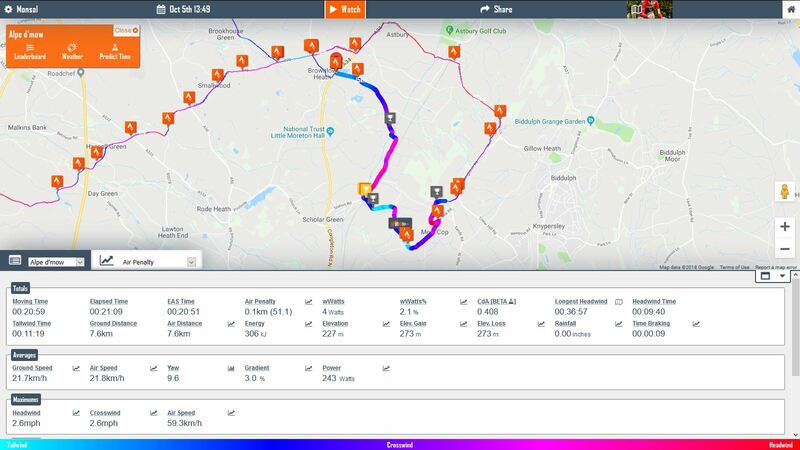 Available on Routes and Activities, you can now filter Segments based on their calculated..
wWatts% – Premium members can find the most favourable or least favourable segments. 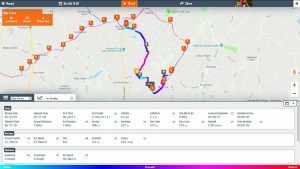 myWindsock Segment Filter helps you find the most interesting Strava Segments. Things were getting a little over crowded with the Point Popup covering the charts, map and data. This isn’t necessary for larger screen sizes so for Tablets, Laptops and other devices with larger screen areas. So on these devices you will now notice that the Point Popup is a Point Sidebar and now lives next to the Map and Data areas. Point Popup is now a Point Sidebar for larger screens. We’ve made it easier to create a custom power plan for your next Route. There is now a Create Interval button when you select a Strava Segment on your Route. Click ‘Create Interval’ to set the Watts and CdA for your Segment effort. Set your target power for your planned Segment efforts for improved pre ride reconnaissance. 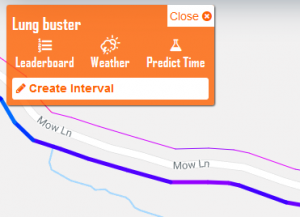 Easily customise power by clicking Create Interval on any Strava Segment. 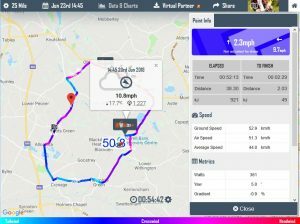 Your Strava Routes and Activities now have a small offset applied to the Wind Lines. This is to help distinguish the Wind Line colours on roads that you ride in both directions. Wind Lines are now automatically offset to improve visibility. We were getting frustrated at having to reset our course settings every time we viewed a course forecast. So they are now saved. If you set Offset, Wind Shear or any other course setting you do not have to set it again on your next visit. We hope you enjoy the latest feature upgrades. Go to your myWindsock Dashboard. 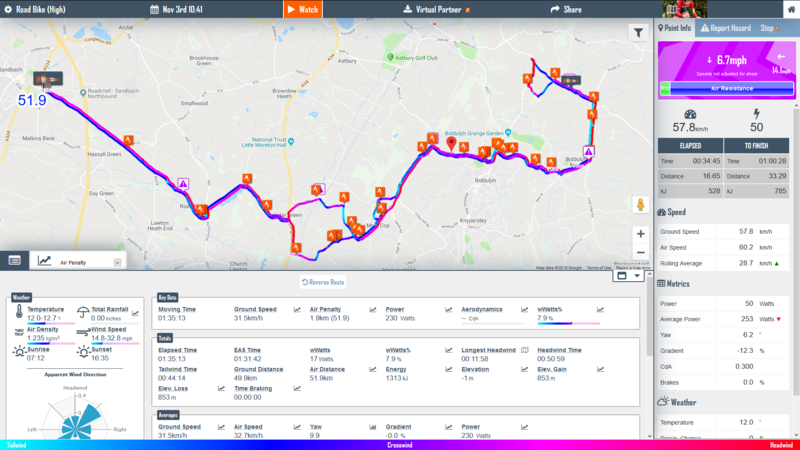 We have been improving how we display Segment information to you on your Strava Activities and Routes. Now clicking on a Segment will reveal the segment myWindsock WindLine and summary information. Charts are also zoomed in to the selected Strava Segment. View Segments directly on Activities and Routes. Clicking the Watch button will step you through your effort displaying the prevaillng wind, power, speed and lots more data. We hope you like this upgrade. We have lots more coming soon! More features this week. 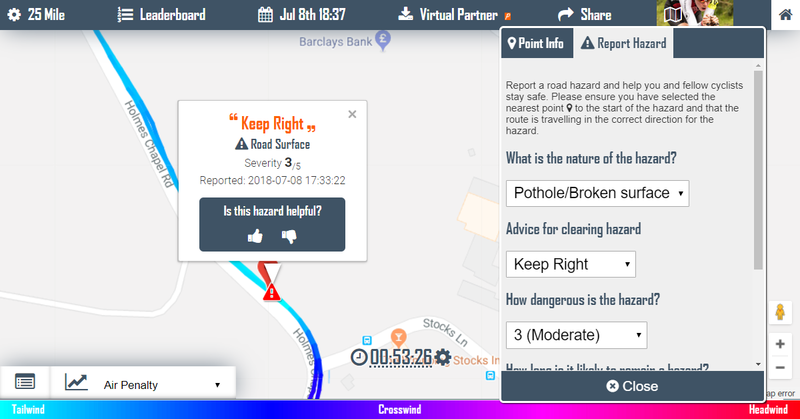 Sit back and relax while viewing the twists and turns of your forecast with Point Player; report and bewarned of hazards on your routes with the Community hazard system and more. Community Hazard system – this is a big update that we hope you will find useful. It is still being refined so please let us know your thoughts about this new feature either on Facebook or contact us. The idea is that we can share hazards such as potholes on the roads that we ride. Click on any point on your course to reveal the Point Info popup and click the Point Hazard tab to make your Hazard report. You can up vote and down vote hazards by others which will help keep the relevance of hazards high. 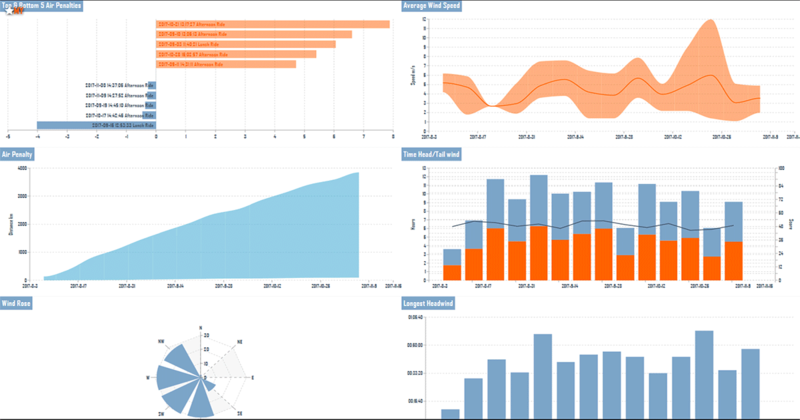 Charts and Data location – On all devices including mobile, desktop and tablet the lower panel which shows charts and overview data, has new options. It has always been possible on desktop to resize the panel however you now have the option on all devices to completely hide show at 1/3rd and 2/3rds height. Point Player – It is now possible to sit back and view the twists and turns of your forecast, viewing how your ride develops point by point. This is a Premium feature. I have some big leaps in functionality for you this week. 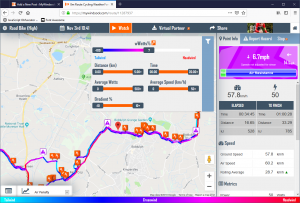 Including the new Point Info popup that gives you a point by point view of the forecasted conditions and your past performances. 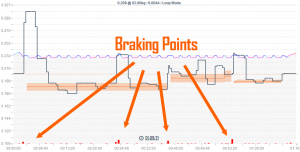 Plus a new Chart showing when and how much you braked, plus the option to remove braking points from your CdA calculation. New Point Info Popup – Tapping/clicking any part of your course will activate the Point Info popup. This gives you lots of information for the specific point on the course that you have clicked. 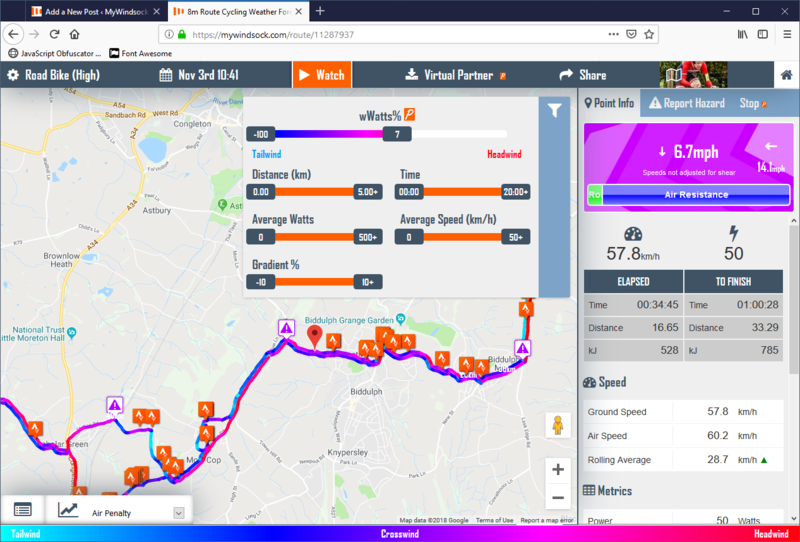 Once activate you can move your cursor around the course and view how the conditions and metrics change. The ‘Wind Window’ demonstrates the prevailing wind direction. Remove Braking from Loops Mode CdA Calculation. I have enabled this option as default as I believe in most cases it will give the closest approximation of CdA for general riding including time trialing and other forms of racing. I also believe this will actually lead to the retirement of Dirty Mode as an option. I recommend for field testing that the option is deselected as it is useful to isolate your loops that have braking within them so as to provide a clear picture of good loops vs bad loops. New ‘Detected Braking Points’ Chart. The process of identifying and removing braking from CdA testing has revealed new data that could be useful. Useful if not only to view the success of the Loop mode identifying your known braking points. 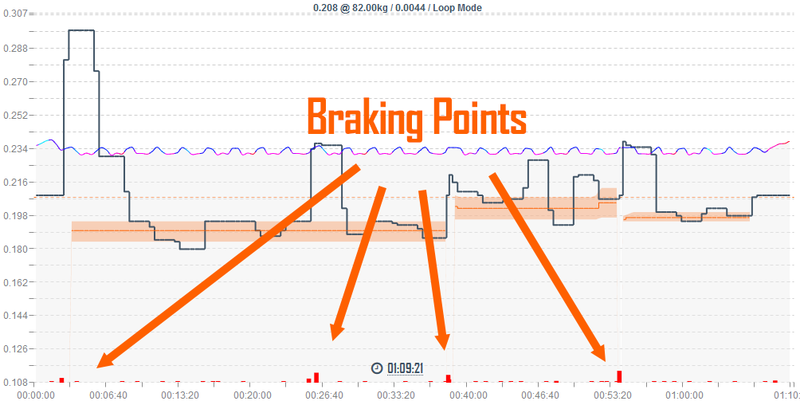 Braking Points added to CdA Profile chart. This will help you view which of your loops are possibly affected by braking. Map Marker Linked with Charts. Moving your cursor around the chart will also show a marker on the map and update the Point Info popup if activated. Crosshairs on Charts. 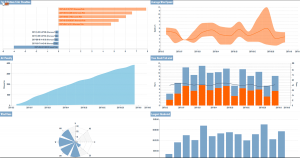 Charts have greater visual precision with crosshairs coupling time and data. New ‘Rolling Average Power’ chart. 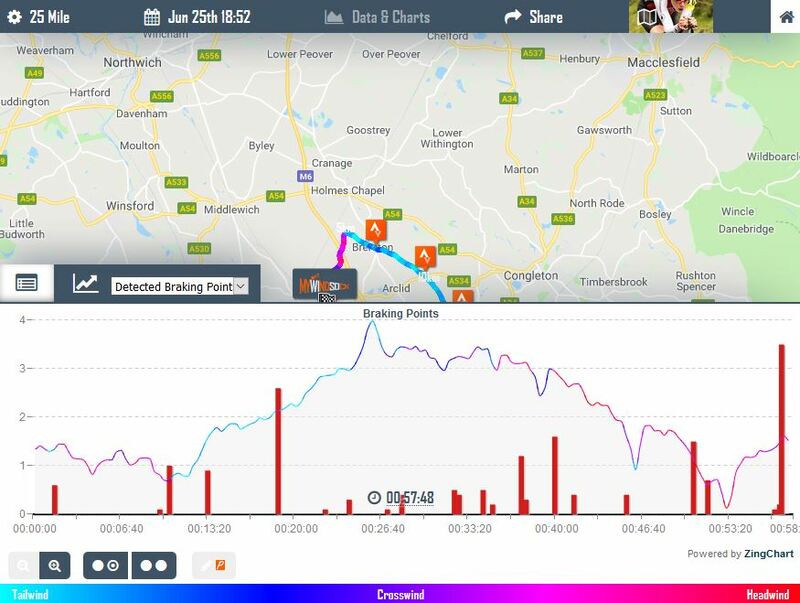 Shows how your average power is progressing during your ride. Usage is similar to that of the Rolling Average Speed. Leaderboard Bug Fix. Fixed a bug with the Leaderboard Wind Rose where an error would be triggered if Wind Rose hadn’t completed loading when Leaderboard Tabs clicked. 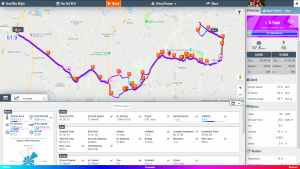 Start using the new features on your Rides and Routes. This week we have a few updates that we hope you will enjoy. You are using ‘Loop’ mode. ‘Loop’ mode requires minimal braking to be a true calculation of your CdA. For general riding ‘Dirty’ mode is more suitable as this attempts to filter out braking and anomalies. Your Performance Profile has errors in it. As part of the CdA calculation weight and rolling resistance are important. If these parameters are far from their true values your CdA will be incorrection. Check that you have entered in your combined weight with bike, clothing etc. CdA calculations are especially sensitivie to incorrect weight inputs for hilly rides. You dragged your brakes down hills. This is very difficult to separate from non braking data as there isn’t a large enough difference to create outliers to filter. Especially when there are long descents. Your brakes were dragging on the rim. You didn’t calibrate your power meter or it received a bad auto calibration during your ride. You were wearing unusually baggy clothing such as a rain coat. If you don’t upload power data to Strava we can not calculate your CdA. If you want to protect your power data. Try uploading the TCX file directly to myWindsock. When doing field testing ensure you have the highest position recording setting on your bike computer. For Garmin devices this is ‘GPS + GLONASS’. Experiment with the detection sensitivity. Lowering the Loop Tolerance will detect more loops but be increasingly less accurate. If weight, rolling resistance or drive train loss parameters are changed your CdA will also be different. Keep an Aero test profile that keeps this values the same to help compare CdA from ride to ride. Only a small section of my out and back Time Trial has been measured. Why are wWatts higher in the Winter? During the Winter months your may notice that your wWatts (weather watts) are higher than those you have been seen in the Summer. The main reason for this is Air Density. Colder temperatures bring us higher Air Densities, which means greater air resistance. Air Density is the mass of air in the atmosphere measured in kg/m^3. As the mass of air increases so does the resistance we experience when traveling through it. Here’s an interesting video demonstrating the affects of temperature on Air Density. Why does this affect wWatts? We anchor the wWatts metric to an average air density. So as above average Air Densities are experienced when it is cold in the Winter the resistance and therefore Watts required to achieve the same speed. Low Air Density also explains why PBs are often achieved on warm humid days at the Summer. Premium members can now start using the new Dashboard View. This provides an overview of the weather you have ridden in. There are many charts available including Highest Average Windspeed, Wettest Rides and Hottest and Coldest temperatures. This is currently a Beta release and therefore we are expecting some troubleshooting. If you would like to provide feedback please contact us. The latest chart to assist you in going faster on your bike is the ‘Delta Compare’ chart. 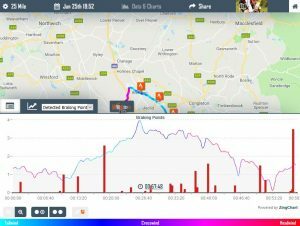 When making pacing changes or alterations to your setup that involve a compromise between power, weight and aerodynamics, it can be useful to view how these changes affect our times in comparison to the original setup. This is perfect for viewing the advantages and disadvantages between Road and Time Trial bike setups. View the time gains from lighter more powerful positions over a heavier, less powerful but more aerodynamic setup. Can your riding style assist in offsetting the time losses on certain parts of the course? The new Delta Compare graph shows all this by displaying the time gains and losses. View where the latest setup or performance change gains and loses time. This is a Premium member chart, view all benefits of Premium membership here.